IT Spending: Can You Keep Up with the Joneses? Never have there been as many IT-enabled initiatives capable of actually increasing revenue as there are now. So it makes sense that IT spending overall is skyrocketing, as companies compete to keep up with this wave of innovation and opportunity. 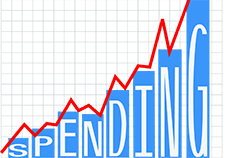 Worldwide IT spending is projected to total $3.7 trillion in 2013, a 4.2 percent increase from 2012 spending of $3.6 trillion, according to the latest forecast by Gartner, Inc. And according to CIO Research's recent Tech Priorities survey, 48 percent of top IT executives indicated they expect to increase spending this year. This is in large part due to what IDC calls a market shift beyond the “exploration” stage of spending on the 3rd platform (mobile devices, cloud services, social technologies, and big data) to a full-blown, high-stakes “competition” stage amongst top companies. The mobile boom is driving both spending and revenue upward: in 2013, the sales of smart mobile devices (SMDs)—smartphones and tablets—will grow by 20%, generate 20% of all IT sales, and drive 57% of all IT market growth. Without SMDs, IT industry growth would be just 2.9%. And two-thirds of Americans who own cell phones use them to access the internet, according to a recent study by the Pew Internet & American Life Project. That doubles the amount from 2009, when only 31% of people said they used their phones to go online. Social media is also a big factor in spending growth: according to a survey from the Creative Group, 62% of Executives expect increased spend on Facebook alone in 2013. And the latest front line of the technology arms race—cyber security—has only just begun. Companies will be closely watching how much their competitors are investing in new technology, so as not to fall behind. Spending more on technology generally means hiring more IT resources, and outsourcing is one of the more resourceful ways to compete for top talent in the technology "arms race." Where else is the money going? Gartner predicts that by 2015, information-smart businesses will increase recognized IT spending per head by 60%. “As the jobless recovery continues, many large enterprises will find it less difficult to justify IT and business investments…Implications are pent-up demand for infrastructure replacement between now and 2015; and frustration over system failure, poor availability and an overall decline in IT service levels.” To control spending, CIO’s will have to decide which IT initiatives will yield the best return on investment, and acquiring top talent will enable them to operate these initiatives more efficiently than anyone else as they race to the top. So our answer is yes, you should be trying to "keep up with the Joneses" by investing heavily in new technology. But how do you avoid spending yourself into bankruptcy? We recommend finding the right IT resources to make good on your investments. One way to do this is by transitioning to a blended model of full-time, part-time, and contracted talent. Companies that embrace these models will be in the best position to secure the most elusive, talented IT professionals capable of pushing critical IT projects, brands and businesses forward.